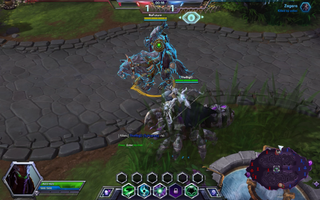 The goal of team battles in a MOBA like Heroes of the Storm is to keep yourself (and your teammates) alive while simultaneously killing your opponents. That way, once you succeed you have a valuable time window where the enemy is sitting through a cooldown, just waiting to respawn. I mean: if you succeed. In a Quick Match game I played last night with a friend and one other player who went by the Battle.net handle “TheBigD” (see above), things...didn’t exactly go the way we were hoping they would. Nor did they go the way the enemy team was hoping. Really, it was embarrassing for everyone involved. Every single person died. Every. Single. Person. Does anybody come out ahead in a situation like this? I guess our Valla stayed alive...but only because she was trying to push against their top-lane defenses super hard. Just like a super-easy-to-kill, no-real-siege-capabilities champion should be doing when the rest of her team is off fighting. Or rather, fighting and then promptly dying. P.S. Apologies for the 50 Cent song playing in the background, it didn’t occur to me that my capture software would record whatever I was playing on Spotify while playing the game. I’ll figure out how to make it stop doing that once I also figure out how to get it to start recording my voice whenever I’m speaking through my headset as well.